as described on this page. Wind-profile statistics, provided the Met Office, for the first month of operation (February 2007) indicate a slight (but noticeable) reduction in data quality. 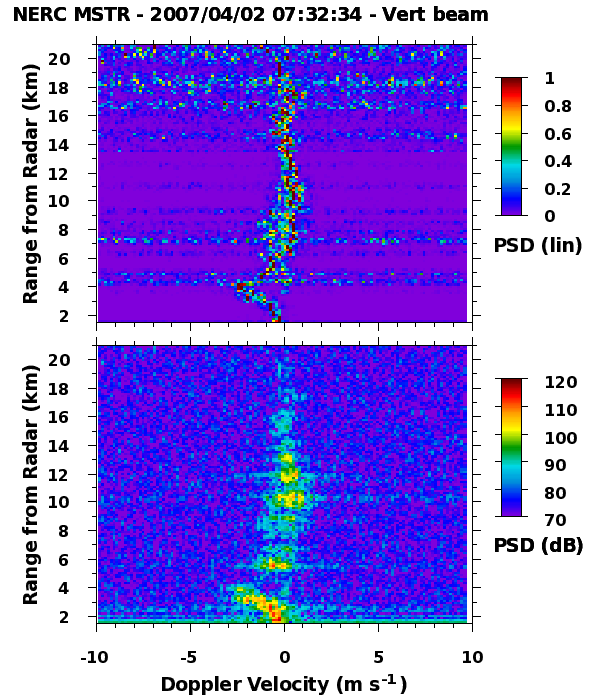 It is suspected that the cause of this change is the use of the Hanning data weighting window in deriving the radar return Doppler spectra. Consequently a switch to use of the Rectangular window (as used by the old data acquisition system) was made at 07:32 UT on 2007/04/02. 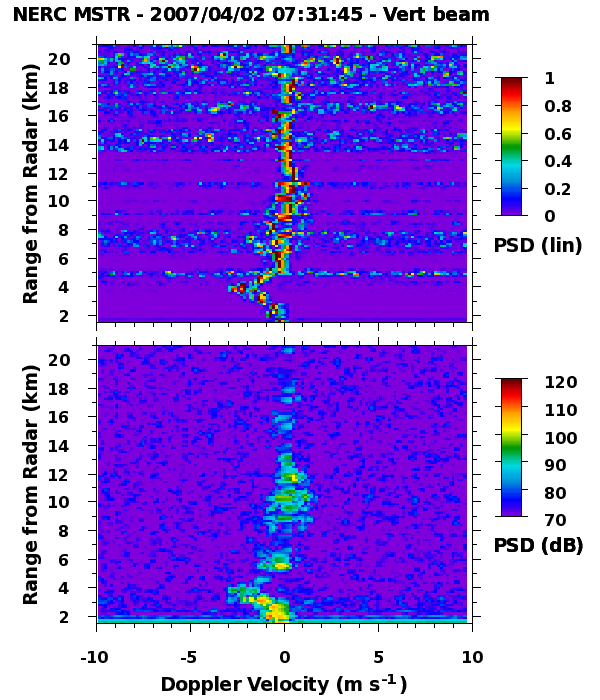 Hooper, D. A., Signal and noise level estimation for narrow spectral width returns observed by the Indian MST radar. Radio Sci., 34, pp 859-870, 1999. The plots below show radar return Doppler spectra (in linear units in the top panels and in logarithmic units in the bottom panels) for spectra derived using the Hanning window (at 07:31:45 on 2007/04/02) and for spectra derived using a Rectangular window (at 07:32:34 on 2007/04/02). As expected, the Rectangular window spectra show signs of spectral leakage - apparent as horizontal banding in the Power Spectra Densities (PSDs) in dB units (i.e. bottom panel) at ranges of around around 2.5, 5.5, 10.5 and 12.0 km. This causes the noise level to be overestimated for spectra with the largest peak PSDs. It is for this reason that the Cartesian data files record only the median noise power over all range gates, thereby avoiding contamination from individual overestimates. However, by way of compensation, the effects of dc contamination in Rectangular window spectra can be corrected by replacing the PSD of only the central velocity bin. By contrast, it is necessary to replace the PSDs of the three central velocity bin to remove dc contamination from Hanning window spectra. This is apparent as a blocky-ness of the central PSDs in linear units (i.e. the top panel). It was thought that the effects of dc correction for the Hanning window spectra would lead only to a slight degradation of the quality of vertical velocities which are close to zero. It should be noted that vertical velocities are more often than not close to zero, which is the reason that this effect is now thought to be the cause of the reduction in horizontal wind data quality. It should also be noted that the version 3 signal processing software was developed to take into account the effects of spectral leakage in Rectangular window spectra. This change from the use of the Hanning window back to use of the Rectangular window should not consequently lead to a further reduction in data quality. It will be necessary to wait until the Met Office release wind profile statistics for April 2007 (expected in mid-May) before it is possible to say whether or not the choice of data weighting window really has been the cause of the change in data quality. The consequences of the implementation of the new data acquisition system.